Welcome to Norwescon 39! I hope you all have a fantastic time exploring our theme of Remembering The Future as you attend our wonderful programming over the week- end. In addition to our numerous panels, our Guest of Honor line-up is also tremendously exciting. Please come by Opening Ceremonies to meet them! Finally, our convention is really fun, but it couldn’t happen without the contribution of hundreds upon hundreds of volunteer hours put in by our staff and also YOU! Please come by Volunteers to find out how you can help make this convention awesome. Tanya Huff lives in rural Ontario, Canada, with her wife Fiona Patton, two dogs, and, as of last count, nine cats. Her 30 novels and 75 short stories include horror, heroic fantasy, urban fantasy, comedy, and space opera. Her latest novel was a new Torin Kerr book, Peacekeeper #1: An Ancient Peace (Oct 2015), and her next will be Peacekeeper #2: A Peace Divided (Oct 2016). Janny Wurts has turned her dual talents toward creating a seamless interface, using pictures and words to explore imaginative realms beyond the world we know. She graduated from Hampshire College with a focus on art and writing, she rented a studio apartment in the carriage house of naturalist Daniel P. Mannix, whose rehabilitation of wild animals allowed her a unique opportunity to draw and sketch directly. William K. Hartmann is known internationally as a planetary scientist, writer, and space artist. His 50-year science career includes discovery of the moon’s Mare Orientale basin, the modern theory of the origin of the moon, measuring ages of Martian surface features, and studies of asteroids. DAW Books, founded in 1971 by veteran paperback editor Donald A. Wollheim, along with his wife, Elsie B. Wollheim, was the first publishing company ever devoted exclusively to science fiction and fantasy. 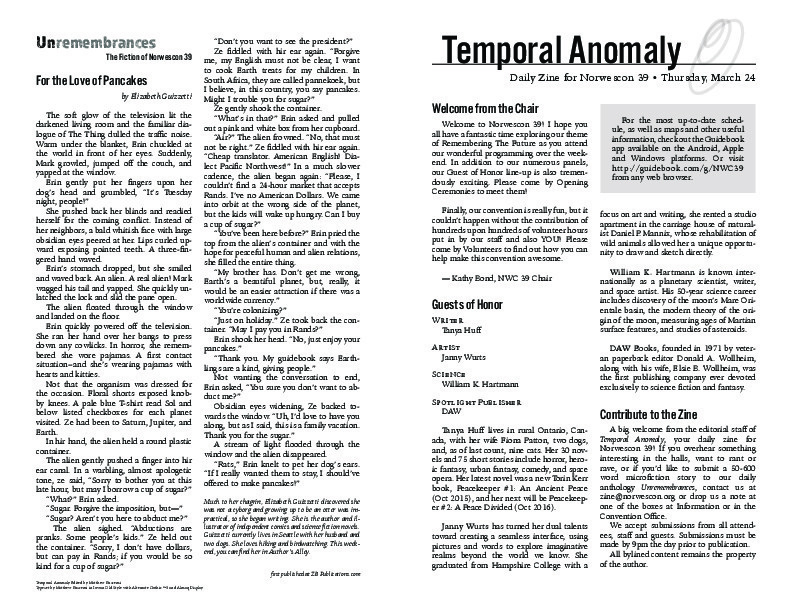 A big welcome from the editorial staff of Temporal Anomaly, your daily zine for Norwescon 39! If you overhear something interesting in the halls, want to rant or rave, or if you’d like to submit a 50-600 word microfiction story to our daily anthology Unremembrances, contact us at zine@norwescon.org or drop us a note at one of the boxes at Information or in the Convention Office. Tanya Huff’s thirty novels and seventy-five short stories include horror, heroic fantasy, urban fantasy, comedy, and space opera. She’s written four essays for Ben Bella’s pop culture collections and the occasional book review for The Globe and Mail. Her Blood series was turned into the twenty-two-episode Blood Ties and writing episode nine allowed her to finally use her degree in radio and television arts. She can be found on twitter @TanyaHuff. Through a combined career as a fantasy artist and author, Janny Wurts has turned her dual talents toward creating a seamless interface, using pictures and words to explore imaginative realms beyond the world we know. She graduated from Hampshire College with a focus on art and writing. She can be reached at: jannywurts@paravia.com. William K. Hartmann is known internationally as a planetary scientist, writer, and space artist. His 50-year science career includes discovery of the moon’s Orientale Basin, the modern theory of the origin of the moon, measuring ages of Martian surface features, and studies of asteroids. His science fiction novel Mars Underground was published by TOR. Visit http://guidebook.com/g/NWC39 for the full schedule! Kate Jonez and Michael ‘Tinker’ Pierce will not be attending the convention. Due to circumstances beyond our control, we have unfortunately had to cancel the Norwescon video channel. Costume Foundations I: Where To Start? (COS24): Tammie L. Dupuis (Moderator), Anita Taylor, Victoria Sha er, Margo Loes, and Lori M. Edwards. (POP08): Dan Murphy (Moderator) and Wendy Murphy. Is This a Technical Manual? (SF14): Bart Kemper (Moderator) and Cynthia Radthorne. (SPA12): Jude-Marie Green (Moderator) and Greg Hallock. (WRI07): Dean Wells (Moderator), Peter Orullian, Frog Jones, and Nina Post. Get to bed early tonight, because Movie Previews start rst thing Friday morning! Keith and Alan are very happy to be back and ready to bring the latest from Holly- wood straight to your eye/earballs. Our one show this year is Friday at 10am in Grand 3. So much genre stu to talk about; movies, TV, theme parks, the whole gamut. Grab your seat early for all the latest. Get a good night’s sleep and BE THERE! The soft glow of the television lit the darkened living room and the familiar dialogue of The Thing dulled the traffic noise. Warm under the blanket, Erin chuckled at the world in front of her eyes. Suddenly, Mark growled, jumped off the couch, and yapped at the window. She pushed back her blinds and readied herself for the coming conflict. Instead of her neighbors, a bald whitish face with large obsidian eyes peered at her. Lips curled upward exposing pointed teeth. A three-fingered hand waved. Erin’s stomach dropped, but she smiled and waved back. An alien. A real alien! Mark wagged his tail and yapped. She quickly unlatched the lock and slid the pane open. The alien floated through the window and landed on the floor. Erin quickly powered off the television. She ran her hand over her bangs to press down any cowlicks. In horror, she remembered she wore pajamas. A first contact situation--and she’s wearing pajamas with hearts and kitties. Not that the organism was dressed for the occasion. Floral shorts exposed knobby knees. A pale blue T-shirt read Sol and below listed checkboxes for each planet visited. Ze had been to Saturn, Jupiter, and Earth. In hir hand, the alien held a round plastic container. Ze gently shook the container. “What’s in that?” Erin asked and pulled out a pink and white box from her cupboard. “You’ve been here before?” Erin pried the top from the alien’s container and with the hope for peaceful human and alien relations, she filled the entire thing. A stream of light ooded through the window and the alien disappeared. Much to her chagrin, Elizabeth Guizzetti discovered she was not a cyborg and growing up to be an otter was impractical, so she began writing. She is the author and illustrator of independent comics and science fiction novels. Guizzetti currently lives in Seattle with her husband and two dogs. She loves hiking and birdwatching. This weekend, you can find her in Author’s Alley. Matthew Buscemi, “Temporal Anomaly (Thursday),” Norwescon History, accessed April 20, 2019, http://history.norwescon.org/items/show/202.